Introducing OLIGHT!! Olight manufactures an extremely high quality line of super bright LED flashlights, headlamps, tactical lights, gun lights, and lights for any occasion or occupation. From half a lumen to 9000 lumens in brightness, there is an Olight for any task. Like all KF7P Metalwerks products, these are tested and approved personally before offered for sale to my friends. Perfect for checking on the tower during a storm or emergency use, Olight has some of the smallest and brightest lights available today. 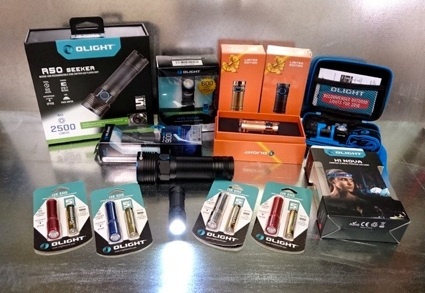 Common features: All Olight models are waterproof, shock proof, and boast a 5 year warranty. Don’t see what you want below? Send us an email and we will find it for you. Keychain lights are incredibly useful and should be a part of every ham’s daily carry. The i3E and i3S are extremely compact flashlights with a maximum 90 to 120 lumens running off of a single AAA battery. The i3E flashlight features a high-performance Philips LUXEON TX LED and a PMMA TIR lens that focuses the light to reach out up to 44 meters. Available in Black only (other colors discontinued). H1 Nova and H1R Nova available below! Our growing collection of Olight flashlights! Model comparison of Olight flashlights we carry. Light, lanyard, spare O-rings, user manual. The M1X Striker is a dual-switch tactical LED flashlight featuring a high intensity output with a compact form factor. The M1X Striker features 5 brightness levels ranging from 0.5 lumen to 1000 lumens plus a strobe mode. The light is powered by 2 × CR123A batteries or a 1 × 18650 battery. With a strike bezel and a dual-switch for tactical application, the M1X Striker is an ideal flashlight for self-defense and every day carry. This light does not come with batteries, but they are available below. Universal magnetic charger, works with CR123A and 18650 sizes. CR123A lithium replacement batteries, Note: This is NOT a rechargeable battery, but a high output disposable battery. CR123A batteries typically have a 10 year shelf life, but is warrantied from Olight for one year. Rechargeable batteries are available (but not listed here), call for details. 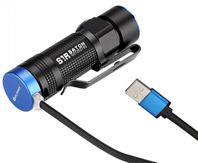 The S1 mini baton flashlight is developed from the award-winning bestseller S1 Baton. We made the S1 smaller, brighter, and more functional because that’s what we do. We used a new machining technique to give the body a braided metal look offering maximum grip and extreme comfort when holding for an extensive amount of time. We brought back our signature magnetic tailcap for hands free use when it is connected to any ferrous metal as well as a red low battery indicator and lockout mode built into the side switch. The S1 MINI also comes with an RCR123A battery that charges directly with it’s built in micro-usb port so there is no external charger necessary when you are on the go.